Take a closer look at the full featured BLAZER BDP400 Series by Carotron Inc. Finally, a real alternative in packaged DC motor drives. We have taken our standard of reliable, economical, and performance oriented D.C. drives and loaded them with an unprecedented list of standard features that make them attractive for a wide range of applications. One very important feature of the BLAZER BDP400 Series is control circuit isolation. The control circuit of each model is completely isolated from the power circuit. This isolation protects reference circuits and feedback circuits from possible damage due to accidental shorts to ground. Also this standard isolation greatly simplifies master reference, tachometer follower, and process control applications. Another primary feature is A.C. line contactors for safety disconnect during normal stop conditions. Logic in the BLAZER control circuit assures that current flow to the motor has ceased prior to de-energizing the contactors. This reduces electrical stress and increases contactor life. Encoder or pulse tachometer feedback is another key standard feature in the BLAZER BDP400 Series. This feature allows frequency signals required for process monitoring to be used to improve speed regulation and simplify system requirements. Other standard feedback methods available in each model are armature voltage or 7 and 50 VDC tachometers. An accessory drive circuit monitor, Model DCM100-000, is available to assist in set-up and troubleshooting by plugging into the control board to easily access 20 separate signals. 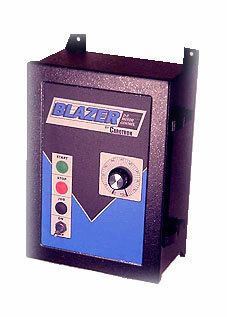 Additional features of the BLAZER SERIES are listed on the following pages. As you can see, these units are loaded with innovative features that can simplify your drive applications.